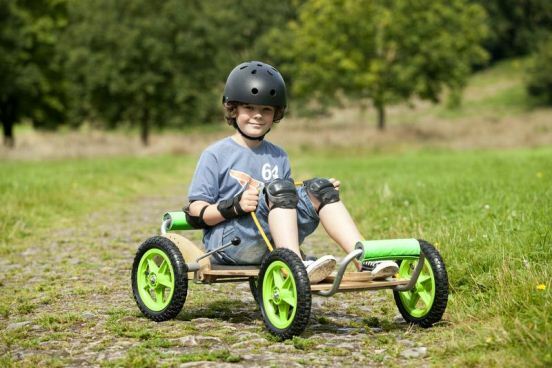 GIVEAWAY: Win a £175 All Terrain Kart! Isn’t this terrific? 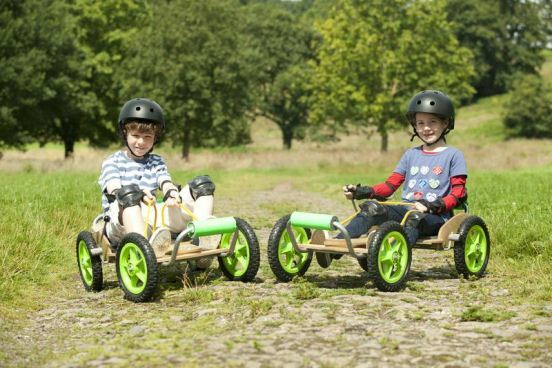 It’s an All Terrain Kart worth £175 – and I have one to give away to a lucky Miss Thrifty reader. Scroll down to find out how you can enter and win. 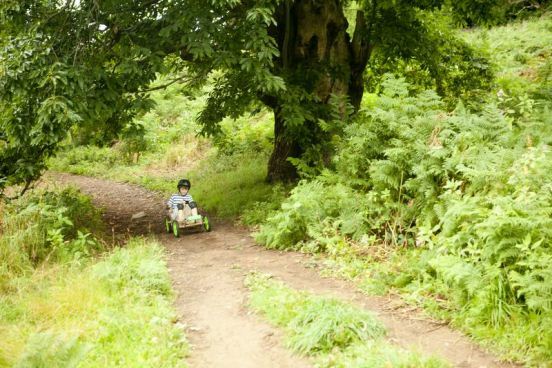 All Terrain Karts have been specially created for children aged 7-12. 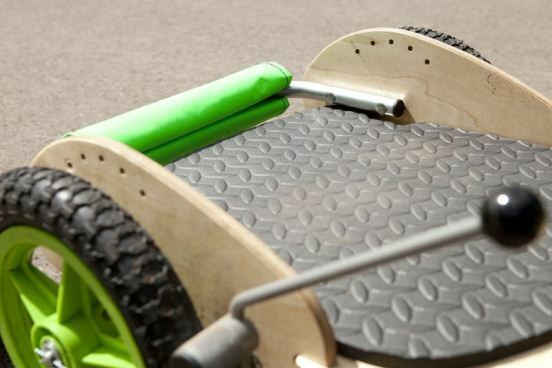 Flexible and tough, they aim to provide hours of outdoor fun. 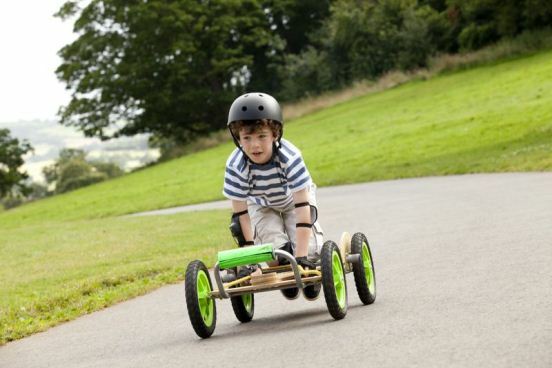 Accessories and spare parts are available to buy online, and these karts are made to last. 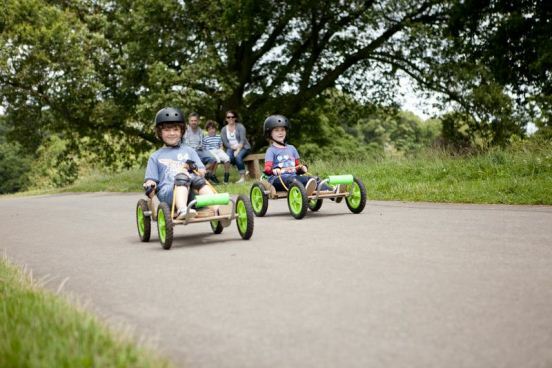 The karts are built in Great Britain, and fully tested to CE standards. 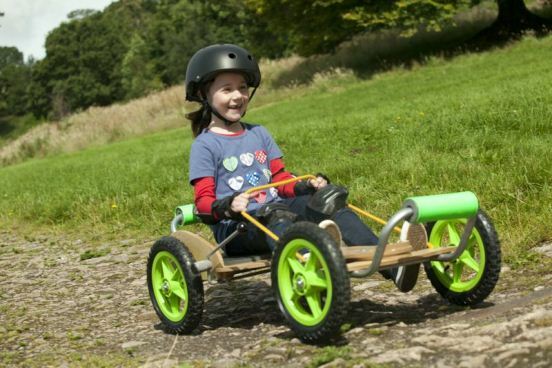 Features include pneumatic tyres, a handbrake, an adjustable back, front padded bars, and a rope for steering and pulling. 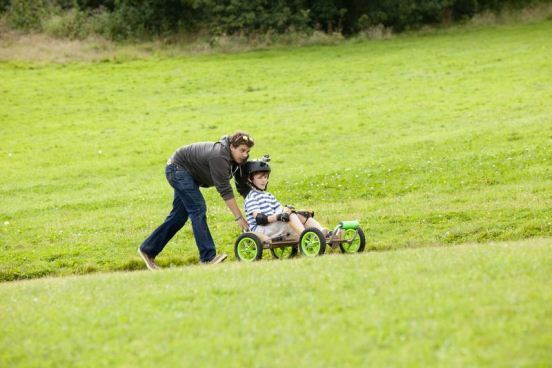 You can find out more about All Terrain Karts here, and follow All Terrain Karts on Facebook and Twitter. The competition is open to UK residents aged 18 or over, and the closing date is 5 pm on Friday 14 December, so get your entry in now. The winner will be picked at random. BONUS ENTRY 1. Add your tip for finding a bargain gift for a child to the Miss Thrifty Facebook page – anywhere on the page will do. BONUS ENTRY 2. 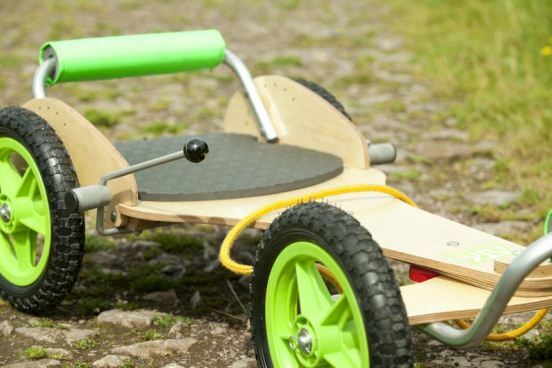 Follow Miss Thrifty on Twitter and tweet the following: I’ve entered the giveaway to win a £175 @AllTerrainKart with @Miss_Thrifty: http://ow.ly/g09Uo. UPDATE: This competition is now closed. The winner has been drawn, and it’s a Miss Thrifty Facebook follower: congratulations, Hester Grainger! With money being particularly tight this year (single mum blah blah,) I’ve actually bought a lot of stuff from our local charity shop. Sounds a bit harsh, but actually my 8 year old Dexter loves playing board games and so I picked up 3 that cost me less than a fiver! He’ll just enjoy spending time with me as I’m normally at work all the time. Also bought him a leather jacket from eBay as he wanted to, and I quote, “look cool.” He will be chuffed to pieces! A great gift you could put together for a child is a “art box” or “crafts box” – I had one of these made for me when I was a child and I adored it for years and years! 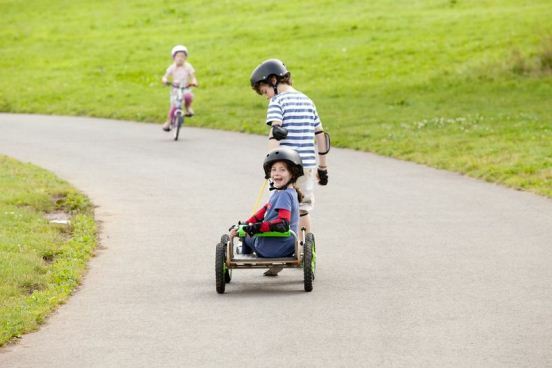 The child will have endless amounts of fun and will be able to explore their creativity and imagination. You can also join in with them and make things together. You’ll be surprised with how much fun you’ll have too! Just buy a big plastic box with a lid – if it has shelving or compartments inside even better, but not necessary. Now you’ve got that, all you did to get is lots of bits and bobs to go inside! Such as: multicoloured card/paper, beads with a bead box, string, ribbons, wool, multicoloured lollysticks, stick-on googly eyes, pompoms, faux feathers, pva glue with spreading stick, prit stick, cellotape, stencils, felt tip pens, stamps and ink pads, colouring pencils, drawing pencils, water colour paints and brushes, ready-mixed paints with non-spill pots, a kids sized apron, etc. You can buy all sorts to go inside! All these things are pretty cheap to buy and you can buy most of this from places like eBay, craft/art stores, £1 shops, etc. I would say, enter your competition and win would be the best answer!!! Im not sure how well this falls into the world of Thrifty shopping for a child.. However, if your in need for some Apple Products for your child you could potentially save up to 20% through the Apple Store. Simply google “itunes store student” and click on the relevant link, there you can go through to the itunes/apple store under the guise of a student. If you’re a bit unsure myself and a friend of mine, used our childs primary school and then carried on with the purchase. Saved around £300 on a new laptop and iPhone…! As i said, not theee thriftiest of ideas, but big savings either way. My kids love to have their stockings filled with lots of practical bits and pieces that they are going to need anyway like toothbrush, toothpaste, flannel, pants, socks, soap etc That way they feel they are getting a gift (they really do love it and get excited about it each year), and mum makes a big saving as it doubles up as a christmas present when I would otherwise be buying it anyway. Make up sewing kits which include felt cut to desired shape, large needle, brightly coloured thread, sequinned or buttons for decoration & stuffing if necessary. Or baking kits – all the ingredients you need to make cookies in one jar with simple recipe & cutter attached. To gather your own bits ‘n bobs is much cheaper than shop bought kits. One of the loveliest gifts my children were ever given was a glass storage jar filled with flour and sugar. At the top of the jar was attached a Father Christmas biscuit cutter and a hand-written label saying how much butter to add and how to make the biscuits. So simple, so thoughtful and they had a wonderful time baking! I like to scour ebay for bargains, because second-hand toys have sometimes hardly been used (I found a racing car track for a tenner this year, still in its original packaging), and the local charity shops, which are particularly good for books and jigsaw puzzles. I even bought a dance mat for £3 which will go under the tree, courtesy of our local Sue Rider shop. I’ve got bargains on Ebay, especially when they end middle of the morning. ask them! it might seem silly or could be expensive!, but there is nothing more upsetting on Xmas morning for that one gift they wanted, just hasnt materialised. It doesnt have to be an expensive item, sometimes you’ll be surprised at what they would like to have. check your supermarkets……if they have a surplus or item selliing slowly they reduce them ….sometimes down to a quarter of oringinal price. l know…l work in one! Check stores like Poundland or 99p stores for trinket gifts like money boxes or colouring sets. For a child who is getting a doll, it’s so easy to run up or knit (or both) a full wardrobe in next to no time! You can even match the clothes to the child’s clothes – I found this was a great hit! Oh my goodness my 12year old would love this…i have had to veto most of his christmas list as it is too expensive. Yesterday he told me he would love some bubblewrap……maybe my thrifty tip is to give them exactly what they ask for! Buy throughout the year as keep a small stockpile of gifts which can be used as stocking fillers etc. Also buy school uniform out of season can get it at 75% off sometime. Ebay and Gumtree are good for older TV show items (my daughter loves Angelina Ballerina so tracked down quite a few items for her). As an advent calendar use small cheap items like hair clips wrapped in tissue paper. Subscribe to PlayPennies superb newsletter, they have got tons of bargains. Take said child to a local market just a couple of weeks before christmas and watch what they “home-in on” – You might be pleasantly suprised. Save nectar and tesco points throughout the year and then use to buy presents. Enter competitions to win presents …just don’t rely too much on this method! I use ebay to grab bargains, and sometimes swap duplicate presents with friends! I try and buy bits through the year when the prices are reduced to make up stocking fillers.Also look out for offers on sites like Groupon you can pick up a bargain.Amazon is also very competitive and also there’s no delivery charge. Fill a box with lots of little presents, then it’s like a surprise as one present turns into more! Wait until January and say you’re away for christmas! What I do is find out what the kids want about half way through the year, and weekly check popular websites that the items are sold on until I see them on sale. It usually means that I have them earlier, but it’s worth it! I have been present hunting all year long and thats how I find the good bargains, by buying when I see the good deals rather than being forced to pay a premium because its christmas. I also keep my eye to daily deal sites, charity shops and toy shops and I dont buy any thing just because its a good price but it has to be for someone in mind. I go to car boot and table top sales. Last year I got half a dozen games brand new in unopened boxes fo under a tenner. I still have one left for this year. I also buy in the sales all year, buying clothes a size larger to fit next year. I think it is important that children learn how much fun recycling is so passing on and receiving “recycled” dollshouses, cots, lego sets which have been properly scrubbed and wrapped is a great way to save money too. Shop around and buy items on special offers from different supermarkets and save pounds! Make some money selling items on Ebay and use it to buy new gifts for Christmas. I haven’t had a lot of money to spend on presents – so I have used charity shops and jumble sales to find some nice items and also frequented the local NCT nearly new sales to find toys in the last few months. Clean them up and wrap up in nice but cheap present boxes. Re-present the gift they showed least interest in from last year. Never fails! Most children grow out of last year’s Christmas gifts during the year so rather than automatically assuming that you need to buy a brand new gift, why not consider using auction sites such as e-bay to find good quality used toys that others grew out of. Large items such as bikes, scooters, dolls houses, etc can always be found secondhand. Most children won’t even notice that the items have been used previously.